Have you ever finished a book, and couldn’t decide how you felt about it? The book itself wasn’t confusing – the plot and characters were laid out nicely, it was written well, and had a satisfying enough conclusion. The uncertainty lies within your own reaction to the story. I think that Grant Morrison excels at provoking this response from his readers. As the reader, you can’t decide if you love the book, hate it, or need to go back and read it over again. 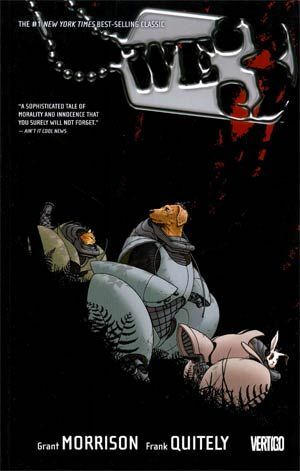 We3 is the story of three biorgs (bionic organisms), a dog (codename: 1), a cat (codename: 2), and a rabbit (codename: 3). These animals have been fitted with bionic weaponized suits. After taking out a high priority military target, their program is decommissioned, and the animals are slated to be… disposed of. “Dee-comm-ish?” asks 1, tilting his head to the side. “No. Grass. Eat. Now. Eat.” replies 3, who is more concerned with his lack of dinner. (Oh, did I mention that the technology enables the animals to talk?) The animals’ keeper, Dr. Berry, can’t bring herself to destroy her research, and lets the trio loose. Without their regular medical treatments and injections from the lab, the three are living on borrowed time, anyway. The premise/reasoning behind the Animal Weapons Three’s development is similar to the pro-arguments for drones. All the destruction of warfare, but subtracting the human soldier casualties from the equation (for your own side of the battle, anyway). The three “lack the fear of death that sets limits on human behavior.” (I found myself thinking of the drones in Iron Man 2…) But as in most technological tales, not everything works out according to plan.